If matter is uniform throughout and cannot be separated into other substances by physical processes, but can be decomposed into other substances by chemical processes, it is called a (an) __________. One side of a cube measures 1.55 m. The volume of this cube is __________ cm3. The symbol for the element lead is __________. Elements in Group 7A are known as the __________. The correct name for SO is __________. In the periodic table, the elements are arranged in __________. When the following equation is balanced, the coefficient of sulfur dioxide is __________. What mass in grams of AgCl is produced when 4.22 g of AgNO3 react with 7.73 g of A1C13? Of the reactions below, which one is a decomposition reaction? The formula weight of lead nitrate (Pb(NO3)2) is __________ amu. How many moles of Co2+ are present in 0.200 L of a 0.400 M solution of CoI2? The molarity of an aqueous solution containing 75.3 g of glucose (C6H12O6) in 35.5 mL of solution is __________. Lead iodide is virtually insoluble in water so that the reaction appears to go to completion. How many milliliters of 3.550 M HI(aq) must be added to a solution containing 0.700 mol of to completely precipitate the lead? Which one of the following is the correct electron configuration for a ground-state nitrogen atom? Which one of the following elements has the largest atomic radius? Alkali metals tend to be more reactive than alkaline earth metals because __________. Hydrogen is unique among the elements because __________. 1. It is not really a member of any particular group. 2. Its electron is not at all shielded from its nucleus. 3. It is the lightest element. 4. It is the only element to exist at room temperature as a diatomic gas. 5. It exhibits some chemical properties similar to those of groups 1A and 7A. Electronegativity __________ from left to right within a period and __________ from top to bottom within a group. A valid Lewis structure of __________ cannot be drawn without violating the octet rule. Of the possible bonds between carbon atoms (single, double, and triple), __________. The O-C-O bond angle in the CO32- ion is approximately __________. According to VSEPR theory, if there are four electron domains on a central atom, they will be arranged such that the angles between the domains are __________. A fixed amount of gas at 25.0°C occupies a volume of 10.0 L when the pressure is 629 torr. Use Charles's law to calculate the volume (L) the gas will occupy when the temperature is increased to 121°C while maintaining the pressure at 629 torr. The heating curve shown was generated by measuring the heat flow and temperature for a solid as it was heated. 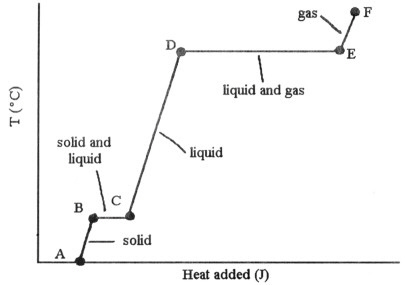 The slope of the __________ segment corresponds to the heat capacity of the gas. 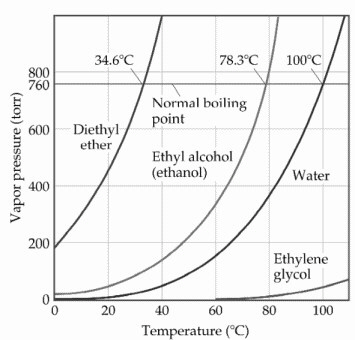 Based on the figure above, the boiling point of water under an external pressure of 0.316 atm atm is __________°C. When the container contents achieve equilibrium, the flask contains 0.84 mol of IBr. The value of Keq is __________. Using the data in the table, which of the conjugate bases below is the weakest base? Which substance is the reducing agent in the following reaction? gets shorter with passing time. gets longer with passing time. gets shorter with increased temperature. gets longer with increased temperature. What happens to the silicon that is a contaminant in crude iron in a converter? it is converted to the tetrafluoride that bubbles out as a gas. It is precipitated as sodium silicate. It is converted to silicon dioxide and becomes part of the slag. It is precipitated as the carbide. It is precipitated as iron silicate. Alkenes always contain a __________.